There’s image editing and then there’s fine art—and Corel has always positioned Painter, its flagship professional painting program, on the creative end of the spectrum. With the release of Painter X3 (the 13th version of the famed natural-media software) for Mac and Windows, Corel seeks to augment Painter’s position as a leading inspirational tool for creatives working in photographic and traditional art, illustration, Manga and comic art, conceptual art, and design. Even though it emerged roughly around the same time as its image-editing contemporary, Adobe Photoshop, Painter holds a unique place in the art world for its drawing and painting prowess. Painter X3 offers an enhanced user experience, workflow optimization, and new technologies for brush characteristics and controls, painting and visual aids, and inspirational details and customization options. With this release, digital paint grows ever closer to actual paint in look and behavior. At the same time, Painter’s major features are now easier to find and use. The following hands-on overview illustrates some of what Painter X3 brings to the drawing table. The Painter X3 interface with the new Search Brushes bar. It’s easy to type in a search term, quickly find the brush you want, and then view it in the Live Stroke Preview. Here, I searched for X3’s new brushes. Painter X3’s new Jitter brush enhancements introduce increased elements of randomness to strokes either by adding universal Jitter properties to any available brush or through one of the 25 new Jitter brushes. Jitter introduces randomness to a brushstroke—you let the program change a certain brush characteristic on its own. Artist mixers let you choose and mix colors on palettes inspired by fine artists working with Corel. A new Brush Search Engine lets you quickly find the exact brush you’re looking for simply by typing search terms, such as names or properties, in the search bar. An enhanced Live Stroke Preview visually ensures that you’ve found the brush you’re after. It offers a more detailed preview of the brushstroke that will appear on the canvas. The preview now visually represents brush parameters such as mixing, erasing, blending, and jitter. The brush preview displays in the Brush Library panel, the Brush Search panel, and the Live Stroke Preview panel. Painter X3 offers close to 1000 brushes in 30 categories. Smart Brush Controls help you change brush properties more easily by providing a context sensitive intuitive way of modifying a selected brush’s advanced controls: The panel displays only the settings you can tweak for that brush. Perspective Guide presets include one, two, or three vanishing points that help set the direction of the perspective. 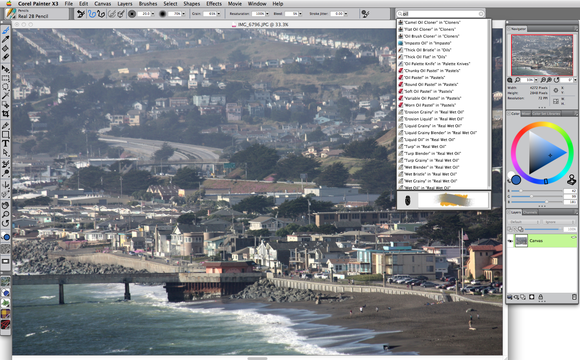 Painter X3 offers enhanced cloning assistance. With crosshair cloning, you not only get to clone from an original source image and view your strokes from the crosshair reference point, you can actually change the source image and continue to clone in real time from the edited version, or switch back and forth between the original and the edited source image for cloning. 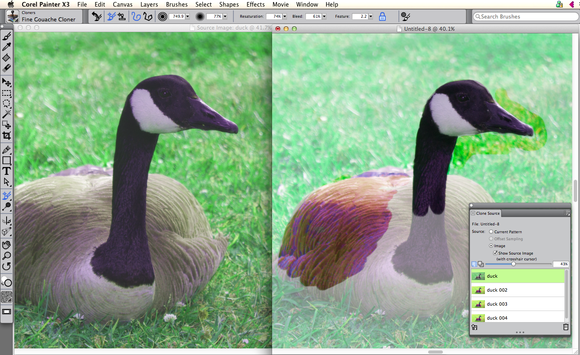 This Canada goose was not born with psychedelic feathers, but Corel's enhanced cloning technique lets you switch back and forth between the source and the cloned image, clone variations to the source image on the fly, and choose which version to clone. 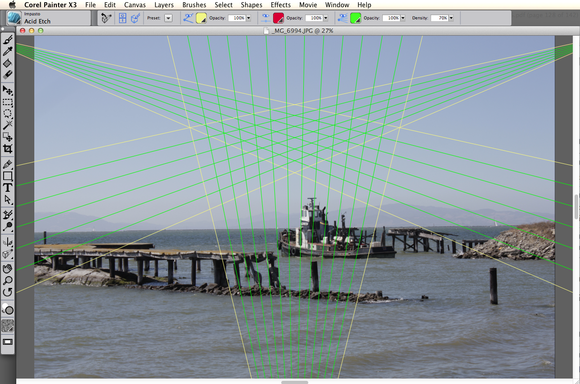 New Perspective Guides allow you to accurately draw in one-, two-, or three-point perspective using preset guides. Perspective-Guided Strokes constrain strokes by snapping them toward the vanishing points set by the artist. This function replaces the old Perspective Grid feature. The Reference Image panel lets you open an image so that it appears inset in the image you’re currently working in; that way, you can keep it in sight without having to toggle between two windows. 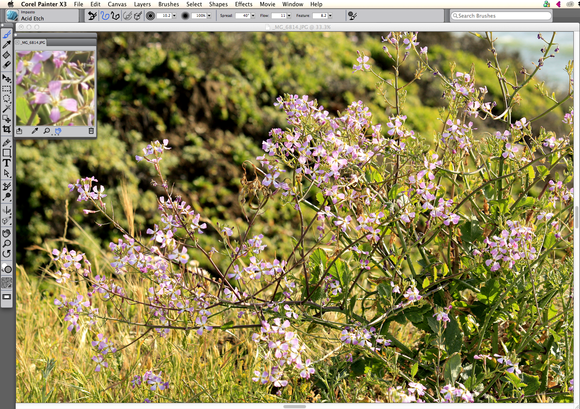 You can zoom, pan, and sample colors from the reference image while maintaining focus on your current painting. You can now apply a transformation to a selection across multiple layers. Inspirational Mixer Pads lets you sample, choose, and mix colors from a collection of original mixer pads created by expert Painter artists. Reference images let you see an inset of your main picture as you paint on a larger main image. Flow Maps are designed to mimic the way that real-life watercolor and oil brushes apply paint across a literal canvas or other nonflat surface—producing less saturation at the peaks of the surface’s texture and more saturation in the valleys. In a free update coming soon, Painter X3 will introduce motion gestures with Painter Freestyle Gesture Control so that you can use your touchpad or Wacom tablet and fingers to control your painting. The new Brush Search Engine lets you choose which brushes to look for. With this release, Corel is initiating more interaction with Painter artists via online Paint Jam sessions, giving users the opportunity to learn from Painter Masters. Each month, the Paint Jam sessions will focus on a different style of art, hosted by professional artists who share their processes and techniques. The first series, hosted by Jeremy Sutton, Claudia Salguero, and Heather Michelle, will take place on August 14 from 3 p.m. to 4:00 p.m. Eastern Standard Time and will focus on fine-art photos. Corel Painter X3 is available in English and can be downloaded now from Corel’s website. Box versions will ship in two weeks. 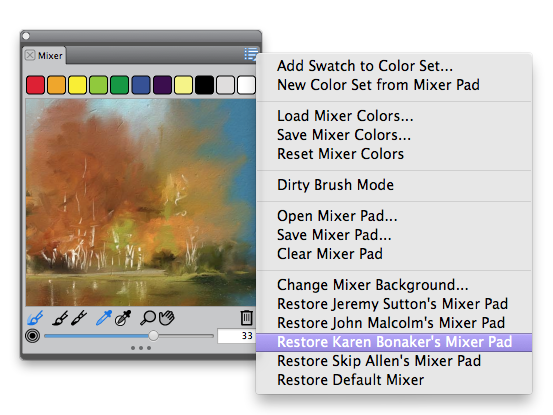 In North America, the full version of Painter X3 is $429; upgrades for Painter 11 and 12 cost $229. Commercial and education volume licenses are also available. The program runs on Mac OS X 10.7 or 10.8, or Windows 7 or 8 with the latest service packs. Watch for Macworld’s upcoming full review of Painter X3.